It goes without saying that SyrPer is professedly down on Barack Obama. This does not mean, however, that, but for satire, we would deliberately spread lies about him or give vent to irrational musings about Obama in a world not far removed from jumbled metaphysics. Unfortunately, Dinesh D’Souza does exactly that in his new schlockumentary: 2016: Obama’s America (2012). You can easily spot the effort to subliminally tune the collective mind of Americans with that creepy little after-thought: “Unmaking the American Dream”. Boy, that sounds really malignant. I saw it yesterday during the Sunday matinee with Bob, whose predisposition toward the president reminds you of a Russian soldier in WWII being told there were some Nazi officers who wanted to surrender subject to conditions. After a leisurely buffet lunch at the estimable new Indian restaurant, Taj, in Garden City, we made our way to the theater and relaxed in total comfort noting there were only nine people in the audience. That was like getting on a mostly empty Boeing 747 and being told to “sit or sleep wherever you like…however you like”. Eight of the viewers were Caucasian with one African-American. Dinesh D’Souza, the producer, writer and director (with John Sullivan) is an American citizen born in India. He makes much of his sub-continental provenance, not so much in order to sound exotic, but to draw a connecting line to his subject, Barack Obama – himself the son of a Kenyan national. He sees a parallel in the evolution of both their personalities, darker men in a white world they must adopt and in which they want to be accepted in order to prosper. He exhibits his palm next to Obama’s to show that the tint is the same. Both studied at Ivy League schools. Both married the same year. Both went into politics. D’Souza reminds me of Farid Zakaria, Navi Pillay and Salman Rushdie; people who are seemingly awash in culture-inversion, desperate in my mind, to be white in brown-face. And so the attack on Obama. SyrPer believes that Obama’s record is lacklustre enough without the need for any forays, well-intentioned or not, into the world of extrapolated psychiatry. It certainly doesn’t need an analysis with a forced thematic, supported by fable or outright fabrication, to make the point that Obama’s election was a disaster. Yet, D’Souza persists in this reprehensible style of film making. The movie’s theme is this: Obama is a communist; a collectivist; an anti-colonialist committed to the downfall of Western white culture because his father, whom he really never knew, was all those things. Since his father deserted him and his white mother when he was very young, Obama had to search out the father’s personality and absorb it as his own. D’Souza’s crazed mission finds its absurd conclusion in a meeting with an emeritus professor of psychology who, after what lawyers call “leading questions”, agrees that in Obama’s case, his mother’s glowing reports about the father instill in Barack a vacuum for all his father’s leftist ideas….his father’s anti-colonialism… his father’s festering hatred of white culture. If you think Michael Moore can go over-the-top, you ain’t seen nothin’ yet. D’Souza’s documentary contains a gigantic howler. If any of you see the movie, remember this: D’Souza tells you why Obama has these iconoclastic beliefs. He comes out and spells it out or you. But he can’t read his own writing. Barack Obama’s mother, was herself, a left-leaning anti-colonialist ideologue, just like Barack’s white grandfather. It’s all there, right under our noses. It should have been there for D’Souza too. After all, he made this flick. But the need to follow an artificial narrative leads the film maker into a miasma of hilariously awkward interviews with people like Daniel Pipes. Pipes, a fanatical Zionist and claimed non-neo-conservative, tells the viewers that Obama sees Israel as some kind of negative phenomenon, all this while commentators keep insisting that Obama is the most Israel-friendly president since his luckless predecessor, G.W. Bush. But nonsense, like microbes, keeps replicating. In an interview with Barack’s brother, George Obama, in Kenya, the director links George’s pro-colonialist posture to his poverty. You see, his brother Barack won’t help him because George looks favorably on a colonialist presence in Africa. Kenya was better when the Brits were there, says George. Well! So! Just for that, Barack allows George to wallow in squalor for his audacity. Barack also sends back the bust of Winston Churchill to England. 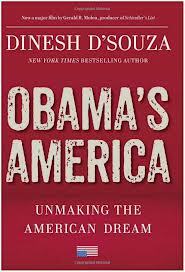 D’Souza guilefully tells us that the act was a hint of his hatred of all things Western and white. What he doesn’t say is that the bust was on loan from Britain and had to be returned. This other pesky fact was pointed out by other critics. D’Souza has done nothing to correct the record. Quod erat demonstrandum. The president demonstrates animus toward all things American. Yawn. But there is more hilarity to all this. D’Souza allows Pipes to remark that Obama has a whole host, nay, an entire cabal of nefarious pre-presidential colleagues, some of whom were Palestinian radicals like Dr. Edward Said and Professor Rashid Khalidi. I met Said and Khalidi and have read their books and articles. Neither one is, by any stretch of the imagination, a radical. Said was a proponent of mutual co-existence in Palestine. Khalidi shared almost the same views and was a rabid critic of Palestinian extremism. He once thought he was excoriating me for supporting Abu Nidal. I let the slight pass without incident. Khalidi was so self-important that when I voluntarily edited a “rush-to-press” book he wrote about the Lebanese civil war, he sent the book back to me with some explanation for his exasperating repetition of the British expression: “in the event”, as “unfelicitous” (sic).